Raison d'être: I'm really good at giving people a hard time. Current city/Neighborhood: Mission District, SF! Favorite city to ride a bike in in the world: HMM....Portl--I mean SF? Helmet or no helmet: Helmet for sure. I feel naked without it. Describe what you like best about your bike: It's sturdy frame can take a beating on these rough San Francisco streets, and can take on some mean dirt trails too. 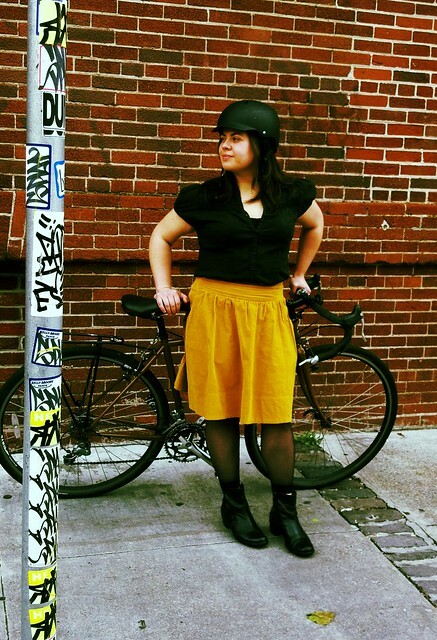 Describe your urban cycling experience: I commute daily from my home in the Mission to my office near Telegraph Hill/Embarcadero. I'm on my bike so much that one day my friends were shocked to learn that I have a car. Tell us a funny story that happened to you on your bike: When I was a student at UC Santa Cruz, I used to ride back to my apartment late at night. It was a beautiful ride! But at night, with no street lights it was pretty dark, and so to avoid being flung over my handlebars by a pothole or ditch I used to wear a headlamp over my helmet. One night, while riding home, enjoying the full moon and the view of the city and ocean below, my headlamp slid off of my helmet and smacked me right between the eyes. Good feeling gone. The headlamp had turned against me. Not funny enough? One time I was riding home from Bi Rite down Guerrero street and this car almost doored me. I stopped and was about to cuss out the driver when I realized it was my friend. We went and grabbed a drink at 500 Club where I lectured her on the importance of looking both ways before opening the driver's side door. Describe your personal style: tomboy-chic?...i don't know kristin, i'm short and curvy. i'm finally learning to wear clothes that flatter me as opposed to only wearing clothes that i'm comfortable in...i'm getting better at figuring out what kinds of dresses i can still bike in without having to hold them down in the wind, or worry about them being so tight that i can't move my legs. before, i usually wore jeans and a t-shirt. i guess you could say i'm finally becoming a lady. Tell me more about your film and The Great Grandfather Project: My film, Reunion, documents my search for my great-grandfather, Shigeo Naito. He was a Japanese immigrant to the United States who also spent time farming chili peppers in Ensenada, Mexico. He met my great-grandmother there and they had three kids. He disappeared one day in 1941 and the family never saw him again. So, in 2008 I set out to find out what happened to him, and over the course of 4 years not only do I discover my Japanese heritage, but I develop a deeper sense of my Mexican-American identity. The Great-Grandfather Club is a project that I developed with filmmaker Alexi Lacey, who is working on a film called Fiji Time. It's about her mother's return to the island of Fiji, where she uncovers the dark past left by her great-grandfather G.H. Lee. Vélo Vogue Tip du Jour: I found one in this month's Tube Times, and I'm passing it on because it's something that will help urban cyclists avoid getting doored! "Bike Sharrows, the white bikes with the arrows on the ground, are placed outside of the door zone. Ride right through the middle of the sharrow and you'll stay safe from any swinging doors." I'll probably still err a little on the left side of the arrow for extra clearance, but still a great tip! Liz seems like a really cool girl. It's great to see more urban bikers around. Thank you, cycle parts! 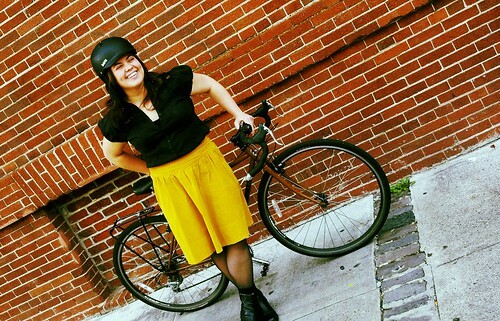 I feel cool now that I've been featured on Velo Vogue!